It’s still a North American summer and we’re all squeezing the last bit out of it. In Antarctica, it’s later winter now. The Antarctic Book of Cooking and Cleaning is prepped, with only some final pre-publication bits left to do including The Office of Gilbert Li‘s final touches. Then we bake it for you. We’ll let you know soon when it’ll be out of the oven and warm. I came across these informal photos from a final shoot of Wendy’s Mulled Wine in late winter. 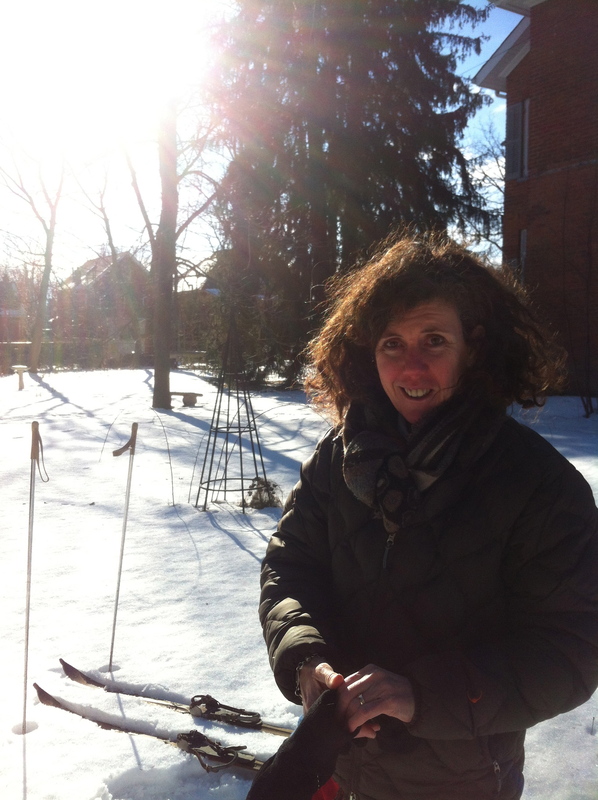 She got out vintage wooden skiis and poles from her wonderful collection of found and pre-loved objects, her neighbours loaned us their big snowy yard. The sun cooperated too. 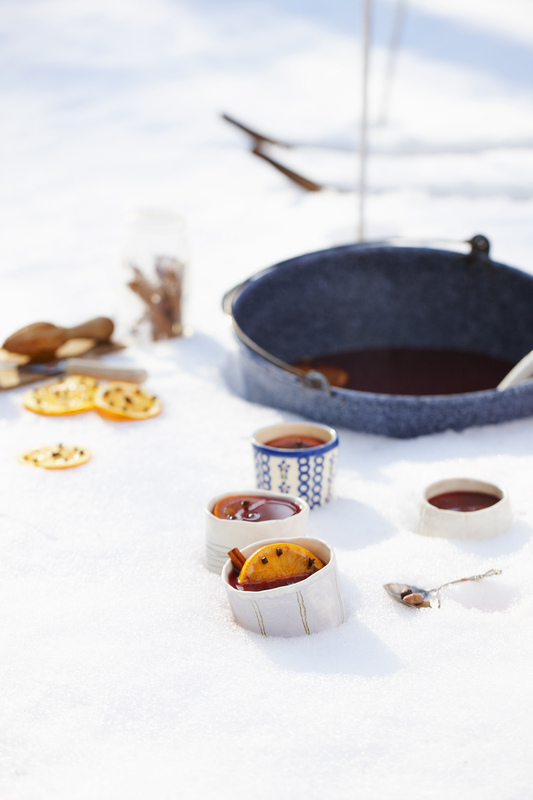 We did sip mulled wine in between shots, how couldn’t you: cloves, fresh oranges, warm red Chilean wine. The gorgeous ceramic cups in the shoot Wendy discovered at The Art Gallery of Peterborough. 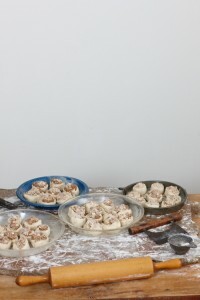 Whilst some photos in the book are original food photos Wendy took, the majority she recreated and Sandy shot. We want you to feel you are in Antarctica. 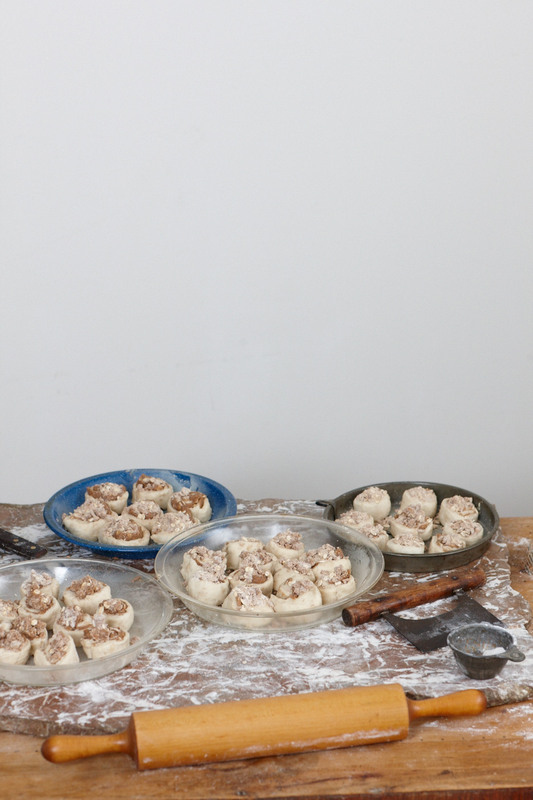 All the touches Wendy made were part of these little food styling voyages. 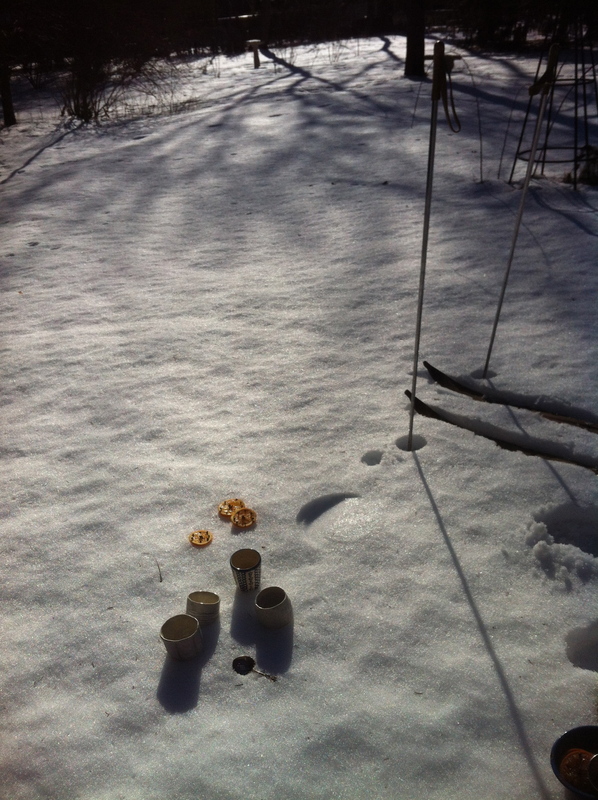 Several objects in the photos are from the Antarctic that Wendy brought home: maps, mugs, bowls while others borrowed, collected and found just could have been. Wendy’s amazing collection of handmade and reclaimed objects are part of her studio and business, ReWorks, that have exhibited this summer in Lakefield, Ontario (Proximity Fine Art) and The Art Gallery Of Peterborough. Later that wintry sunny shoot day, Wendy warmed her hands in her stove after she cooked the last cinnamon buns for an indoor shoot. Once again Cam, Finn & Shackleton (the cat) thank you for your hospitality at your welcoming beautiful home. 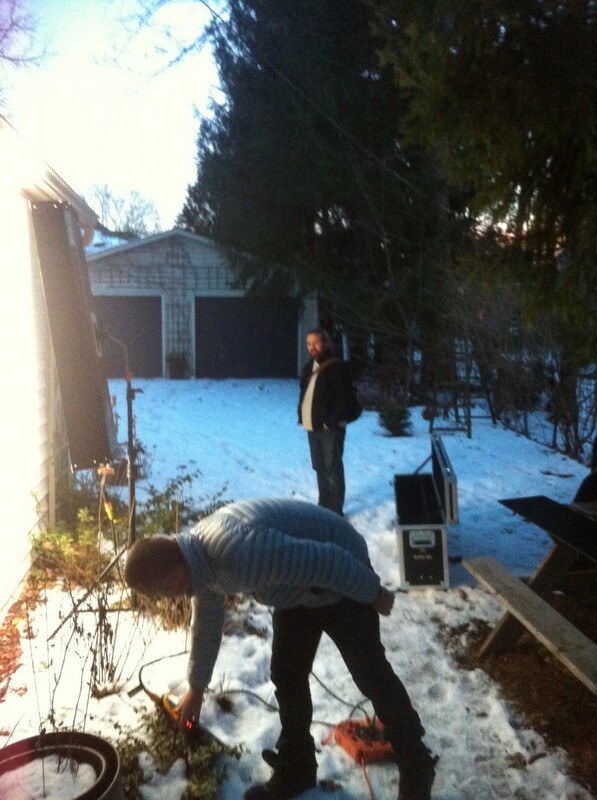 Sandy and Cam Taylor in Wendy & Cam's yard (setting up extra lights, sun going down), Wendy's studio in background. Thank you for your support and interest in our book. It’s been a vast voyage but I’m grateful to have taken it with Wendy, Sandy Gilbert, Isobel, Pat, David, Donna, Nancy and our many other supporters and contributors. Sunday, August 20.—The long-expected blizzard came yesterday—a good honest blow, the drift vanishing long before the wind. This and the rise of temperature (to 2°) has smoothed and polished all ice or snow surfaces. A few days ago I could walk anywhere in my soft finnesko with sealskin soles; to-day it needed great caution to prevent tumbles. I think there has been a good deal of ablation. The sky is clear to-day, but the wind still strong though warm. I went along the shore of the North Bay and climbed to the glacier over one of the drifted faults in the ice face. It is steep and slippery, but by this way one can arrive above the Ramp without touching rock and thus avoid cutting soft footwear. The ice problems in our neighbourhood become more fascinating and elusive as one re-examines them by the returning light; some will be solved.